Italian-born, Los Angeles-based architect Elena Manferdini has become adept at creating vibrant architectural environments made from images produced using digital technology. 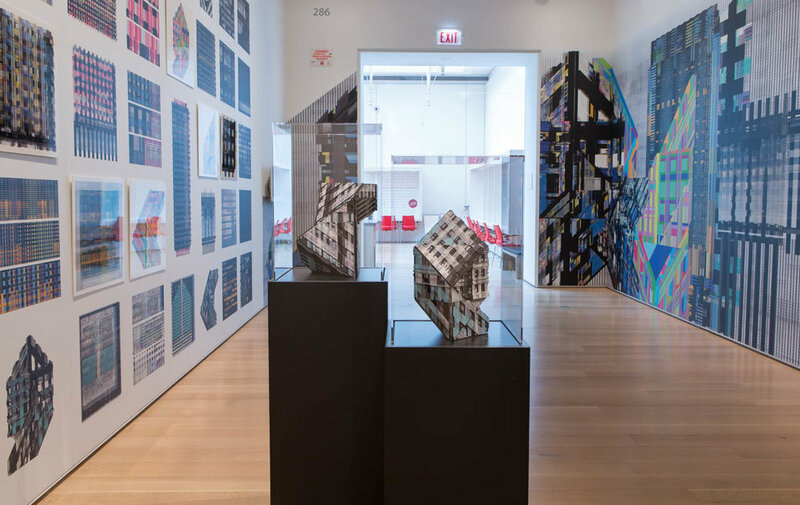 For this new work at the Art Institute, she draws inspiration from the iconic orthogonal geometries of the design of Mies van der Rohe’s buildings, including the twin glass and steel 860-880 Lakeshore Drive apartments in Chicago. Manferdini creates her own unique drawings by first digitally tracing photographs of this internationally recognized building. Although flat—the drawings have an intense three-dimensionality due to the rich pattern of lines and the lush saturated color—they incite the user to view them up-close as well as from a distance. Since founding her studio, Atelier Manferdini in 2004, and through her teaching at the Southern California Institute of Architecture, Manferdini has focused on developing her own technique of image making as a way to create new spatial narratives in architecture through digitally produced drawings. This is the first time, however, that her work has directly referenced another building. It is both an ode to the work of German-born architect Mies van der Rohe, as well as a contemporary interpretation. A pioneer of modern architecture, Mies emigrated to Chicago in 1938 to become the director of the Department of Architecture at the Armour Insti-tute of Technology, now IIT. Formerly the director of the Bauhaus in Germany, Mies’ inventive approach was founded on creating buildings that articulate the significance of the time in which they are made. The strict geometries of Mies’ Lakeshore Drive apartments were inspired by the insistent grid of the city, which frames and defines the urban experience. 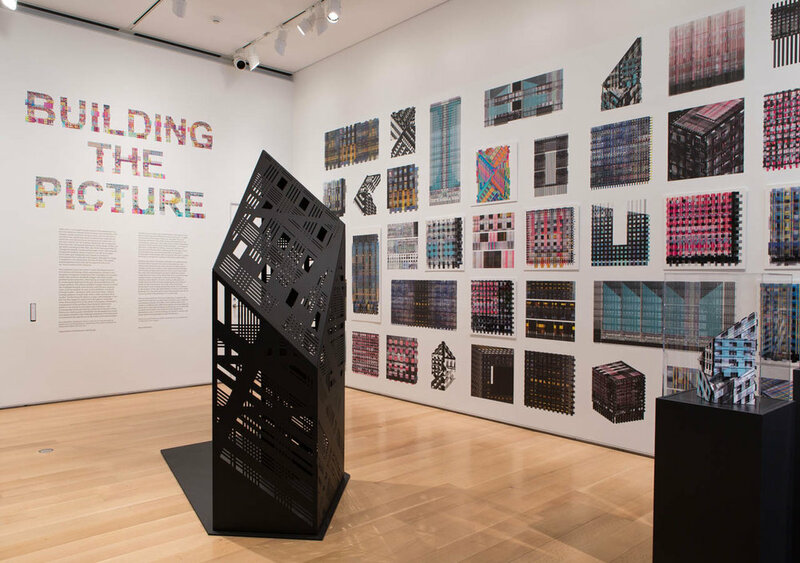 Manferdini has rein-terpreted Mies’ design by creating digital drawings of a grid she traced from a photograph of the façade of one of the towers. She then multiplied this grid and developed unique patterns by weaving the lines and infusing a range of colors and line weights. As seen in this exhibition, a series of intimate studies—printed on both vinyl and metal—explore multiple patterns in small scale, while the video animates these studies. One wall is flanked with a larger format of these images at an environmental scale. The freestanding models give form to the flat images and illustrates how these drawings might work in three-dimensions. Using history as a starting point, Manferdini develops new visual and spatial narratives that challenge perceptions of architectural environments through decoration and ornamentation, ultimately inviting alternative interpretations and inciting us to take note of and question the world around us.